Yahoo! (YHOO) is set to report Q1 earnings tonight after the close with a conference call to follow at 5pm ET. YHOO releases a presentation on its web site a few minutes after the press release. The presentation contains the forward looking guidance Q2 and FY16. Consensus stands at EPS of $0.07 on Revenues of $845 mln. Front and center for YHOO is the strategic alternatives, and more exactly, the sales process of its assets. There are expectations of another decline in both the search and display business for the co as it continues to mismanage any turnaround story. This mismanagement can impact valuations and really screw everything up for them. But markets will overlook those numbers at the moment in favor of commentary surrounding the sales process. Co has more than $7 billion in cash and short-term investments. HQ building in Sunnyvale, Calif.,is ~$400-550 million. The Board also believes that exploring additional strategic alternatives, in parallel to the execution of the management plan, is in the best interest of our shareholders. Separating Alibaba stake from our operating business continues to be a primary focus. In addition to continuing work on the reverse spin, which we've discussed previously, we will engage on qualified strategic proposals. Co will shift most of the resources in this area toward more forward-leaning mobile search investments (MaVEN areas). Plans to reduce workforce by roughly 15% and exit five offices in Dubai, Mexico City, Buenos Aires, Madrid, and Milan; most of these changes will take place in Q1 or by the end of 2016; Result in savings in short term operating expense of $400 million annually. YHOO is expected to return to modest and accelerating growth in 2017 and 2018. YHOO has engaged Goldman Sachs, J.P. Morgan and PJT Partners as its financial advisors. Who are some of the bidders? Verizon (VZ)- Well known as it has publicly stated its interest. Arguably the favorite. Comcast (CMCSA)- Rumors that it has pulled out. Time Warner (TWX)- Rumored to have withdrawn due to concerns on overall business. Alibaba (BABA)- Believed to be interested in its shares that YHOO holds as well as Yahoo! Japan. Dail Mail (Traded in England)- Not believed to be a major bidder. Privates include: Bain Capital, TPG, Advent International, KKR (KKR), Blackstone (BX), Apax Partners, Warburg Pincus, and Hellman & Friedman. Revenue ex-TAC Q1 $820-860 mln, Consensus $906.8 mln. FY16 $3.4-3.6 bln, Consensus $3.85 bln. Sees Q1 GAAP Revenue in the range of $1.05-1.09 bln; FY16 $4.40-4.60 bln. Adjusted EBITDA Q1 $100-200 mln; FY16 $700-800 mln. Non-GAAP Operating Income Q1 ($50)-($30) mln; FY16 $150-160 mln. Mavens expected to exceed $1.8 bln+ in 2016. Exits from businesses expected to cost $100 mln. Expects improved profitability with $1 bln adj EBITDA run-rate by 2H16. $400 mln+ operating expense reduction in 2016. YHOO reports Q4 (Dec) earnings of $0.13 per share, in-line with the Consensus of $0.13; rev ex-TAC fell 15.0% year/year to $1 bln vs the $948.02 mln Consensus. Price-per-Ad +6% y/y; Q3 +8% y/. YHOO recorded a $4,461 million non-cash goodwill impairment charge as a result of annual goodwill impairment test conducted in the fourth quarter of 2015. 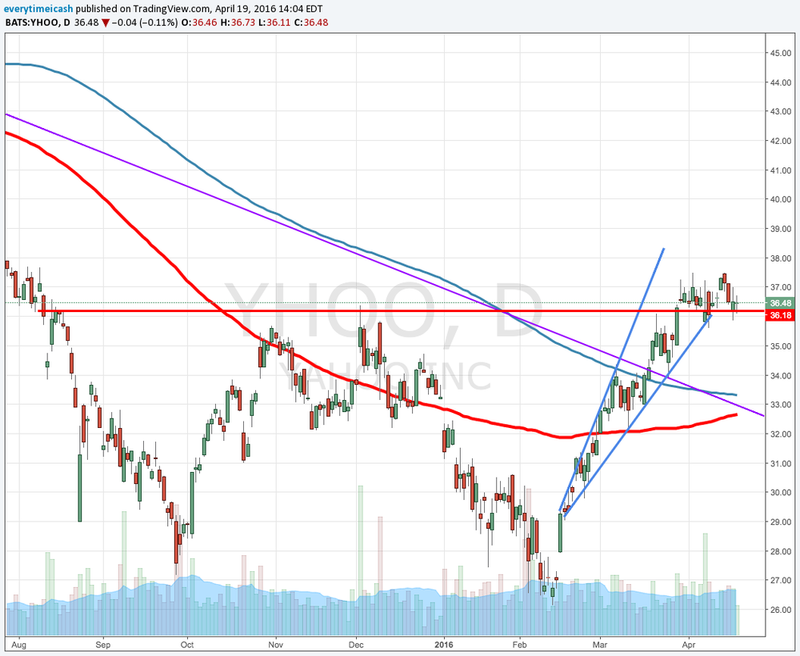 YHOO pricing a 8.3% move on 25,300 contracts traded. Calls outpace Puts 2/1 with IV at 39.3% and 171% higher than their historical (30 day) average.